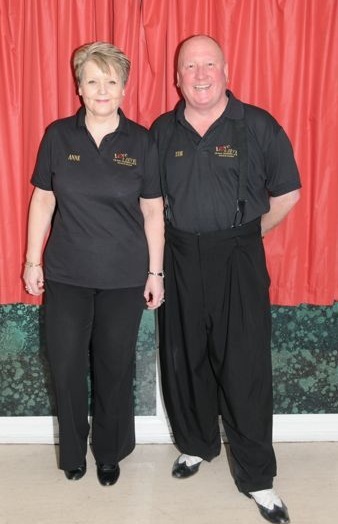 In January 2010, we (Tim & Anne Morton) took over as the new owners of 'Love2Jive' and the classes continue to be as popular and successful as ever. Our Tuesday Night Dance Class one of the most friendly and sociable events on the current circuit, attracting dancers of all levels. Our resident DJ, Andy Kale*, plays both current and classic music to keep you on the dance floor. On our dance evenings, he is always happy to play your favourite tracks. Andy and Becky Kale host a freestyle dance twice a month at Admiral Lord Nelson School, Portsmouth. On occasions, we invite Guest Instructors who bring their own style and personality to make the intermediate class challenging, but fun! We are keen to offer 'special event nights' to our members, including Themed Nights and Freestyles, including our Summer Ball Spectacular, Halloween 'Dance Party' and Christmas 'Glitter' Ball, when we are pleased to provide demonstrations by professional dancers who are experts in their field. We are continually striving to give you the best possible enjoyment on the dance floor and bring you quality entertainment. Our friendly team of Instructors, Demonstrators, Coaches and Crew afford a warm welcome to everyone - newcomers in particular! During the Intermediate Class a team of at least four Coaches are 'on duty' in the small room (by the door as you come in) where they are happy to provide 1-2-1 help for beginners and will be on hand for the rest of the evening to help you practice your dance moves on the floor or give advice / help if you need to perfect a particular move. Our Crew (Welcome staff & DJ) are happy to provide advice on our services, take your music requests and receive your feedback and suggestions. Check out our GALLERY so that you will know who we are!